Sewing, history and material culture until 1920. The American Duchess just opened up the pre-order for her latest shoe offering the Pompadour. I bought the first shoe she created but have been holding off for these ever since I heard about their creation. I really want these because of the awesome toe shape. It is so hard to find shoes with accurate shapes especially the eighteenth century. You can check ou the shoes here and Lauren is holding a giveaway on her blog. a decent fit that gives me a waist! I have some fabric picked out: three metres of a pale lavender fulled wool. It’s not much, nor is it a colour I particularly care for, however this stuff is an amazing example of what wool can do. It is so heavily fulled it is very difficult to see the weave (I think it’s a twill of some kind) but that feature is what makes this fabric so perfect for wet weather gear. The fibres are so closely bound that water beads on top! This is also why I’m not going to attempt to dye it. Not only will it most likely not turn out well due to the likely lack of penetration of the dye, but I really don’t want to mess with the finish on the fabric which the high temperatures required for good dyeing probably would. It probably wouldn’t stand up to a true dunking but it pretty darn good for a fabric without a water-repelling finish. I’ve done a bit of searching online but I haven’t found an extant garment with the details I’m looking for. Ideally I’d like to see something similarin some collection but I think I wider range of sources including images and men’s garments would be useful here. I’m particularly interested in the tailoring details of men’s garment as wool coats of the period generally feature details found on men’s clothing and military uniforms. So here are a few sources of inspiration. This is pretty much what I’m going for. The plate is dated to the French revolutionary calendar of year 14 which I think corresponds roughly to 1805/1806. * This is a nice temporal distance from both the up to date high fashions and geographical source for my lower-class, colonial persona. I think it’s reasonable that a lower class campfollower in Upper Canada could have a coat that stylictically is similar in 1812-14. The great big cape over the shoulders should be great protection from the rain and the long skirt offers great coverage. It’s not going to be easy getting that out of 3 metres but I think the length and coverage is really important to get this to look “right”. Oh well, piecing is period! This fashion plate also has super long sleeves that extand over the hands. A nice feature that I’ll replicate if the fabric allows for it. While the white ruffle hides things a bit I think there’s a standing collar of some kind under there. Sabine at Kleidung um 1800 has numerous lovely examples of outerwear from this period. She is one of those lucky seamstresses able to achieve “the look” of the period with apparent ease! In particular her recent post on a wool spencer has many features that I want to integrate into my coat. 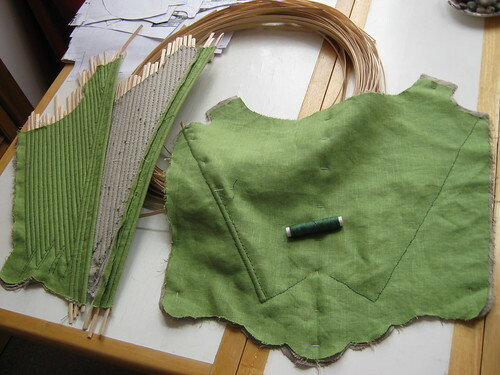 Notably, the use of raw edges, although I will not be pinking the edges, as well as the cut and construction of the lining. The use of different fabric for different areas (i.e. cotton for the sleeves to allow for ease of dressing) is worth a thought although I’m prioritizing warmth over ease of dressing with this thing! Wilcox, David. 2012. “The Clothing of a Georgian Banker, Thomas Coutts: A Story of Museum Dispersal.” Costume 46 (1) (January 1): 17-54. doi:10.1179/174963012X13192178400074. http://openurl.ingenta.com/content/xref?genre=article&issn=0590-8876&volume=46&issue=1&spage=17. I actually haven’t read this article yet. Someone mentioned it on the h-costume list and said that there were details of the lining and such for the coat. I’m assuming that the tailoring information contained there will be both new information and useful even just to inspire my construction methods. I’m away from my books (as usual) so these three sources are hardly the limit of my inspiration but the rest will have to wait awhile. I suspect that this coat will end up moderately accurate as my personal highest standard for accuracy is the replication of an original garment, and when does that ever happen?? I also suspect that this coat will appear far too “new” and “nice” for my persona for at least a few seasons but really my goal with this coat is to keep myself warm. I’ll save my highest standards for day wear that the public will probably see. Oh yeah, I’m going to hand sew it. Just for fun! 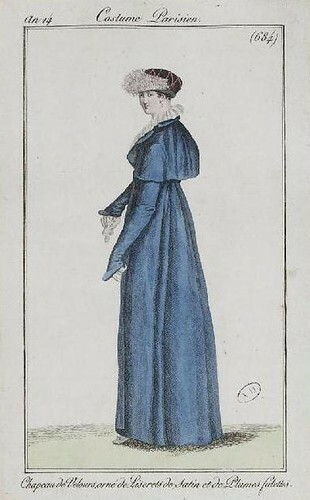 * See this post for an explanation of these dates in relation to fashion plates of the period. Yup. As I predicted the extra linen sewing thread I ordered is a slightly different shade. Well the shade varies in blue tone a bit. If we’re going to get techincal, blue is one of the harder and more expensive colours to achieve so a little variation there is easily explained away. Also, dyeing is an imperfect science even now! The two colours are close enough that they could simply be the product of two different dye baths. Also, the colour variation will be less noticeable when the thread is sewn in individual lines on the stays. Lots of reasons why this isn’t the nd of the world! I’ve also basically given up hope that this set of stays will be the “perfect” set. It doesn’t mean I’m enjoying the process any less! I’ve stumbled upon a bit of time the past few days so I picked up a project I’ve had ongoing for at least four years now. I’ve been pretty good about keeping all the pieces together and while I have all the pattern pieces, I’m missing the shoulder strap fabric. I’m not sure if I cut them out and have since lost them or if I just never bothered to cut them out at all! So far I have both back pieces completed and I just started the front. They’re sort of based on the Diderot diagram for stays, but altering them to fit required significantly altering the boning pattern. I’m using reed I ordered for my first pair of stays from the Silly Sisters but this time I’m doubling up the reed in each channel. I’ve never gotten any real wear out of my first pair but even with just the few times I’ve tried them on, I’ve had a bone break in the front, just off to the side a bit. Annoying! I definitely think that to use reed boning I need to fully bone my stays. Once I get the stays to the point where I can try them on I might even consider strategically replacing one or two with something stronger, maybe even baleen? My method is just one I sort of came up with. I initially sew a seam that acts as a guide for the angle of the bones and then I slip the doubled-up boning in between the layers and push it up alongside this seam. I then stitch along the other side of the bone, continuing to push it firmly against that first initial seam. I usually works well although I did find that the pattern on the two backs are slightly different as a result of the boning pattern growing more or less organically. I’ve since seen evidence for stays boned with baleen where the channels were stitched first and then the bones were pushed into te channels but I haven’t heard anything either way for reed boning (see note). 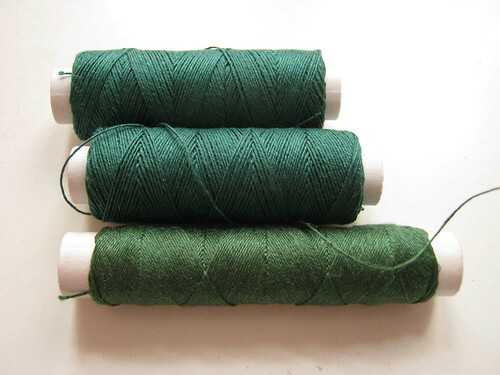 I’m using some green linen thread I got from my aunt for my birthday many years ago. I was just eyeing my spool and I don’t think I’ll have enough to get through this project. If I was thinking straight I would have started on the front so that I at least had one uniform colour there since the new stuff I ordered is unlikely to match correctly but oh well! I’ve decided not to think too hard about my colour choices since I doubt that linen of the period would dye this dark green of a colour but oh well! I was thinking I’d try to line it in leftover red spotted cotton I used in my shortgown. Wouldn’t that be cute? I have some white leather to bind the edges as well. I can’t remember how much of the cotton I have left although I don’t have a problem piecing the lining. Piecing is period and I think it makes projects like these so much more interesting! Many of the stays I saw at the Galliera had heavily pieced linings of various cheery cotton or linen prints. Both these things are back home way away across the ocean so that will definitely have to wait. It feels so good to be sewing again! I haven’t sewn anything historical since last fall!! Note: There’s a dissertation that was completed a few years ago on a stomacher that was concealed in a wall of a building. They x-rayed it and you could clearly see where fibres of the bone had been bent backwards as the bone was pushed into the channel. I can get the specific citation if anyone is interested. As well see: Sorge-English, Lynn. 2005. 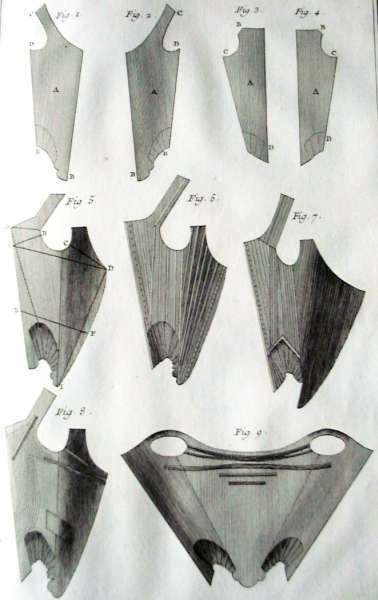 “‘29 Doz and 11 Best Cutt Bone’: The Trade in Whalebone and Stays in Eighteenth-Century London.” Textile History 36 (1) (May 1): 20-45. doi:10.1179/174329505×37112. http://www.ingentaselect.com/rpsv/cgi-bin/cgi?ini=xref&body=linker&reqdoi=10.1179/174329505×37112. I thought about calling this “the lazy corset” Because I basically skipped any pattern alterations whatsoever! I got the pattern from Foundations Revealed and it was taken straight from an original that, according to the measurements, was exactly my size. 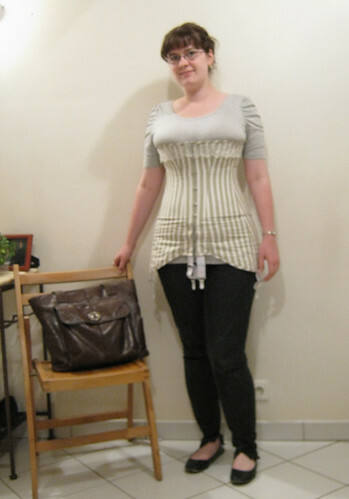 The article is a very interesting read as the corset is in the author’s size as well which allowed the author to directly compare the original corset to her recreation and see how it affects her shape. I wanted to give it a try to, and I did! I have yet to make an Edwardian chemise so please bear with me. The fabric I chose was a slighty waxed, mattress ticking-style cotton. I was looking for an inexpensive alternative to coutil and this fit the bill. It has a herringbone weave and is very stable. It is lighter than the coutil I have used in the past which also interested me as the author of the article above mentions how light the coutil of the original was, in comparison with today’s fabric. I got this at Tissus Reine here in Paris. All the boning, the busk, lacing cord, heavy duty hooks and eyes and the garters came from Vena Cava. I looked for a French alternative but couldn’t find what I needed and so I went with my usual UK supplier. 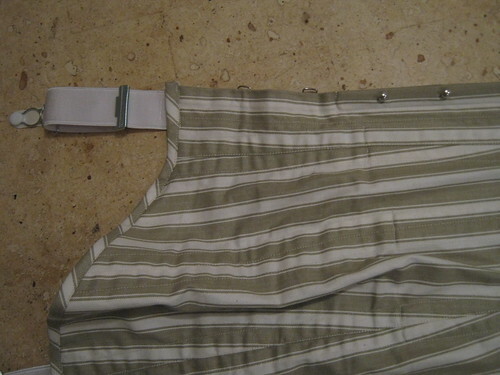 polyester grosgain ribbon for the waist stay. The lacing strips are temporary. My grommet kit is in Ottawa (I think) so that will have to wait a bit. A lot of things with this corset are new to me. My last one I, for some reason, decided to use two layers of coutil which was way overkill so this single layer corset was a great way to explore the alternative. 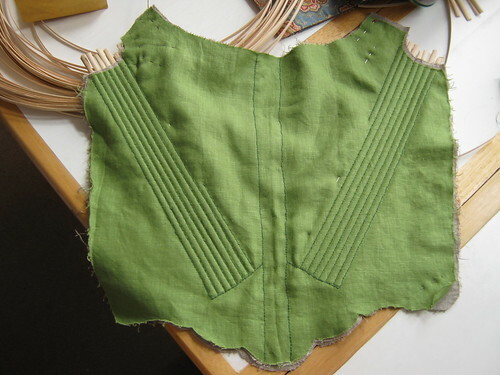 The corset pieces were seamed together and the seam allowances clipped a bit. 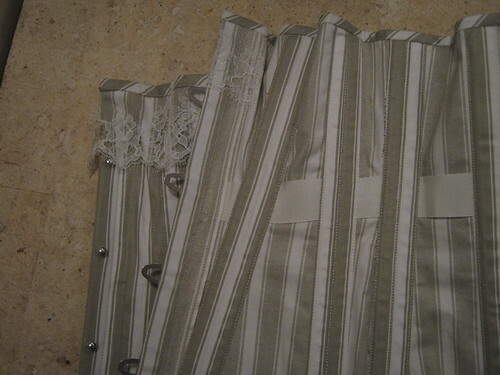 The boning channels were made up as tubes of fabric(with wrong sides together) and the seam allowances clipped as well. The wait tape was pinned into place following the pattern and the casings sewn down along the seams covering all seam allowances. An interesting feature of this corset is that while the boning does not extend all the way down the corset (so that you can sit down!) the casings do. I cut my casings on the long side out of scraps of fabric and just left the extra hanging until I was ready to bind the thing. While the instructions called to bind and then apply the lace, I did it the other way round so that I got those diagonal stripes at the top. I’m pretty happy about the fit over the hips. It laces almost all the way closed which is not what I expected considering the measurements of the pattern. It could be the fabric stretching but it’s actually loose over the hip area so that there is space to sit down. I just think I’m squishier than I had thought! 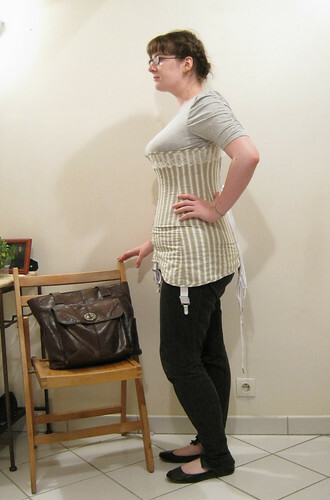 The waist stay actually sits above my waist and this may indicate that I’m wearing it to high. This is how it naturally sat though, and forcing it down would have to happen only through strategic lacing and exerting the right amount of pressure here and there. I haven’t tried it on again since this thought occurred to me but I’ll post back when I have. You can clearly see there isn’t enough room in the bust and this, which I completely expected, is also one of the bigger challenges with this style. I don’t feel I should add much more to the upper edge, rather that I should make more space below the top edge. The bustline of this era is still low although not as low as it had been even in 1905. From what I have seen 1910-1912 is a period of change and at this time the high waist of this era reaches its height. so while this was a bit of an experiment to see how an “off the rack” corset of the period would work for me, once again I feel that I expect a more custom fit than can ever be achieved straight away. So I am considering what to do next. I want to use this as part of my entry in the Your Wardrobe Unlock’d Double Period Project (my unfinished entry in last year’s convinced me to start early). So I do want to make sure i have the right silhouette with the garments I make for on top. With that being said I am now considering if I want to alter this a bit. I have a couple of inches extra of the lace so it shouldn’t be to much of an issue to add more space to the top edge if necessary, and the side front edge actually has a horizontal seam at the waist which makes for a very convenient place for alterations. If I do decide to alter it, I’ll take off the top binding and lace entirely, rip out the boning casings the cover the top half of the side front, and remove the side front pieces all together. I’ll then re-shape the top piece, probably do a couple of mockups and then re-cut and sew it back together. This past Saturday I went fabric shopping(again) with one of the other stagiaires here. I got some of the things on my list! 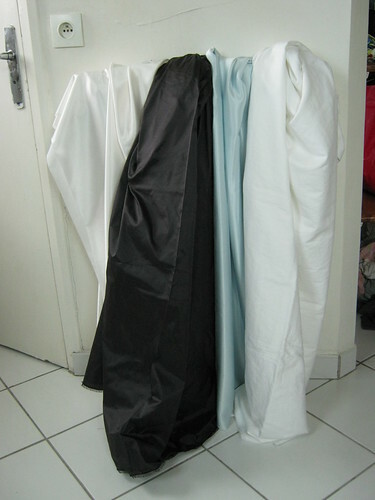 From left to right: white silk satin, charcoal silk taffeta, blue silk satin, white cotton. The white satin and charcoal taffeta are for the that 1790’s dress I posted about. It was very satisfying finding these two because they are exactly what I was looking for, no compromises! I picked the white stain out of a number white satins that had slight hints of blue and pink. This one is ever so slightly off white and contrasts nicely with the charcoal without being blinding. The charcoal is great too as it is a medium weight taffeta and lighter than the other options. It should gather nicely. Now I need to find some spangle for this! The blue satin is for some 1940’s underthings. I was hoping to find a nice dusky rose colour but nothing looked right and I was a little afraid of getting a colour that clashed with my skin tone. Pink is not a colour I’ve played with much. In hindsight cream might have been a bit more accurate but oh well too late! This project could also use some lace. I saw some in one of the stores we were in, I might go back and get a few metres. The white cotton might seem boring but I picked it up because it was a very nice high thread count, but light cotton. It’s perfect for underthings! I’ll probably use some of this for my Edwardian underthings, whenever I get around to them! Posted in Costume HistoryTagged fabric! This past Thursday was Bastille Day and I had a pretty awesome day! I really didn’t do anything all that exciting but a day spent shopping is always enjoyable! Especially if that shopping involves fabric!! I had totally forgotten that today was a holiday until my supervisor reminded me yesterday. Bonus day to sleep in! I slept quite late and I was going to go check out the military parade but I was feeling lazy and it looked kinda rainy out so instead I made myself a big breakfast. I puttered around doing dishes and dealing with laundry and then I made a very detailed list of things to scour the fabric stores and merceries for this afternoon. I had gotten a friend of mine to call one of the big fabric stores, as I am essentially unable to communicate in French on the phone, to see if they were open on the holiday and I assumed that since one store was open all would be. Yeah not so much. Yet I still managed to spend a good couple of hours just browsing through the few stores that were open. Eventually I found my way down a side street to one store in particular that really didn’t seem all that much different from the others, that is until I realized they were selling real silk! 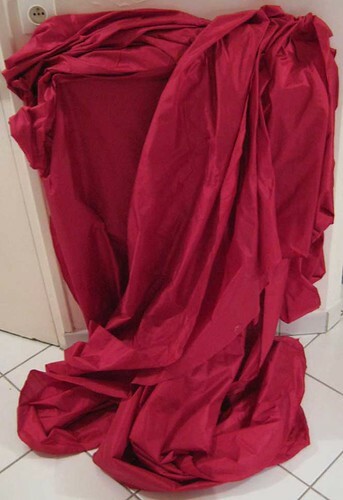 Once inside I found a roll of this fabulous red silk. It has an ocassional very minor slub and is medium weight. Not as light as china silk but not a heavy or crisp as some taffetas. It is, however, the most absolutely perfect shade and weight to recreate a quilted 1780’s ensemble I got the chance to examine during my stage here. So yes I bought it all! And I bargained the guy down 20 euros! After that spot of successful fabric hunting I headed back to the 3rd to find a cafe. I ended up back at this one that my aunt and I had patronized previously. And then I started making a list. First of the way cool fabrics I had seen and not bought, and then of the projects that I should look to get fabric for while I’m here. You see I could probably order fabric from the internet for many of these projects back home but the ability to browse through many stores allows for a certain precision of choice that I just can’t achieve back home. Here there is the possibility of getting the most perfect fabric ever while back home I can probably get one that’s good enough. So I made a list of all the major things floating around in my mind right now that I would like to get fabric for. Guess what – they’re mostly 18th century! First up is the peach Française that the Comtesse de Provance wears in the dressing scene of Sophia Coppola’s Marie Antoinette. This particular dress has always stuck out for me. I like the simplicity of the colours and the deliberate amount of fussiness in the trim and accessories (her hair is fun too!). Although this costume is clearly made of a slubbed fabric like dupioni, I’ll be looking for a smooth taffeta in that lovely shade of pink. The second one that comes to mind is this stripes ensemble from the Kyoto Costume Institute. The challenge with this one is finding a fabric not just with the right colours but also the right balance of colours. Puresilks has several taffetas with these colours but none are quite right in the proportions. I’d also like to pair the dress with that same shade of green accessories. 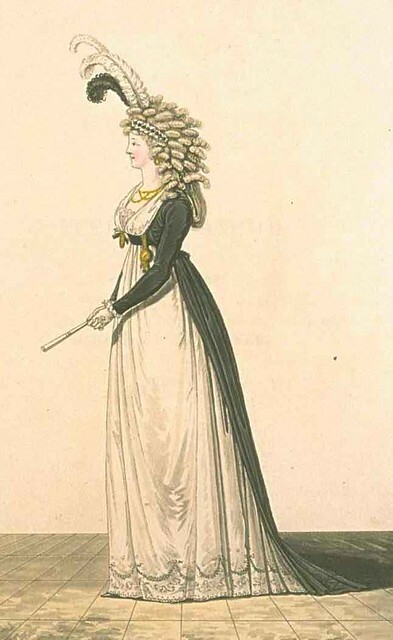 In a bit of a departure from the previous two, I’d like to copy this mourning ensemble from the 1790’s (Natalie‘s excellent detailed blogging of 1790’s styles has definitely influenced me!). The key to this particular fabric hunt is finding the perfect shade of charcoal grey. Of course I’d like to attempt that embroidery and spangles too! 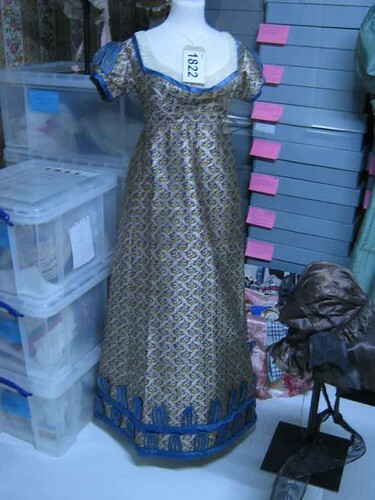 I participated in a trip to the Bath Costume Museum with Your Wardrobe Unlock’d and got some delicious up close pictures of objects in the collection but my favourite by far was a dress on display. Again finding an appropriate fabric has its challenges. The brocade contains many colours including blue, yellow, gold, green, and peach. I don’t expect to find the exact fabric of course but I do how to find one with the same scale of pattern and approximately the same proportion of colours. Another dress that has been only list for a very long time is the Mme Seriziat portrait gown. For this gown I’m looking for a very fine, high thread count voile. Ordinary voile would probably do but I’d really like to find some high quality stuff. I love that you can really see the difference in drape between the fabric of her gown and her fichu! And finally I’m looking to get a few meters of silk satin for some 1940’s style slips and underthings. *whew* that was a long list. Hopefully I’ll find everything I want. Wish me luck!